Man can forgive atrocity of any kind but take away his right to last rituals he will rebel. This is not a formulation based on theories taught in sociology classes, but the reality that has forced lacs of Hindus to leave their ancestral home in Pakistan. In rural Pakistan, dalit Hindus and the people of Bheel communities are not allowed to cremate their dead ones. They are compelled to bury them against their tradition. While government treats all citizens as equal, the social discrimination is so sharp that these people either have to follow what the majority wants from them or leave. Recently in Delhi some of Pak Hindu migrants staged a protest demanding citizenship or at least refugee status and other rights. Some of them came to India more than ten years ago. Some were just ten years then. In these years, they have grown old and adults but their fate still hangs in uncertainty. Rajkumar moved to India from Jhol, a small town in Sanghar District of Sindh province some eight months ago. Sanghar has around 20 per cent Hindu population. His brother, who was a driver, was murdered. For months he knocked every possible door for justice or at least a hearing. After failing to secure even an assurance, he decided to leave. He says, ‘people who were arrested on his report were released within hours’. He still carries his dead brother’s photograph in his mobile. In the photo his brother is chained around the neck, suggesting signs of torture before being slit. He agreed to narrate his story provided he was not photographed. He feared for the lives of his people he left behind. A month back his younger brother too crossed the border and joined him. Rajkumar works in a mine near Jodhpur. In Pakistan he was a farm labourer. He hopes to get at least a work permit so that he can move beyond the limits set by Indian authorities and find work in a farm. Dinesh (name changed on request) was only ten year old when he came to India with his parents from Rahim Yar Khan, a city in Punjab province of Pakistan. He studied in a school run by the Rajasthan government and two years ago completed B.Tech. He cannot get a regular job for his status is a ‘Pakistani on pilgrimage’. Like others, he too is forced to work in a quarry. There are many like Dinesh. Educated but cannot work. Hari Ram had a dream to make his son a policeman. But an incident knocked him down from the dreamland to the rocky surface of reality. His cousin who was able to join the police was killed. Later his people were warned not to try their luck beyond the socially accepted role of farm labourers. Few days after he asked his jagirdaar for a month leave so that he could take his family for a pilgrimage in India. After 13 years of arrival he is still in India. Dinesh, B. Tech, is his son. 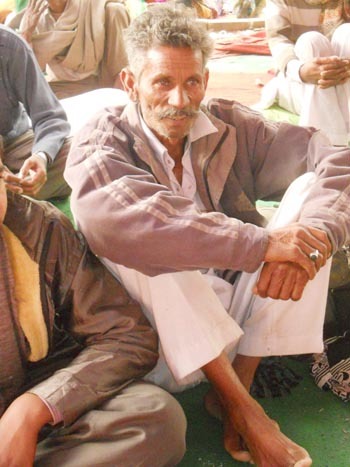 He doesn’t ask for more than refugee status for his son so that he is excused from working in the mines. If they thought their problems would end in India, they realized how wrong they were. India, who is hailed as a model for its refugee policy has turned a deaf ear for these people. Hindu Singh says, ‘this group is left excluded from almost all the surveys and refugee developmental plans/projects undertaken by various national and international segments in India.’ For this reason, the United States Committee for Refugees and Immigrants didn’t incorporate this group as migrant/refugee in India in its World Refugee report 2008. In 2013 Government of India passed the Citizenship (Amendment) Bill, 2011 which paved the way for registration of Overseas Indian Cardholders (OIC). Barring few exceptions the OIC holders can enjoys all the rights of naturalized citizens. However, the people belonging to Pakistan and Bangladesh were exempted from this amendment! India fears that, given the current circumstances, large number of people might like to come from these two countries. However a rough calculation of the number of people who are eligible to apply for OIC comes near to 35 crores! On the one had India is ready to accommodate 35 crore people who have never seen India and on the other hand it refuses to help these people who were once a part of it. Explaining the nature of their status, Goverdhan, a migrant, says, ‘here we don’t have votes so nobody wants to hear us. The Congress party thinks being Hindu, harassed in Pakistan, we will never vote for it. The BJP thinks, it need not do anything for we are by default their supporters! Sometimes democracy is just a calculation. This entry was posted on March 8, 2014 at 5:33 am	and is filed under India, Pakistan. Tagged: Dalits, Hindu Minority Pakistan, Hindus, India, Indian Citizenship Act, Pakistan, Tribal, Vishnu Sharma. You can follow any responses to this entry through the RSS 2.0 feed. You can leave a response, or trackback from your own site.